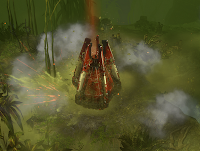 One of my favorite parts of playing Dawn of War II was seeing orks get squished by drop pods, but that scenario isn't even a possibility in a real game of 40K. It's a shame, really. That big huge chunk of metal hurtling down from the sky should be able to do something other than change course to avoid smashing bad guys. Excuse me, I meant avoid a mishap... but really? Wouldn't it be cool to squish something when you land?!?! I'm sure someone else has attempted to come up with rules to simulate this, but I'm going to give it a shot myself because a few quick Google searches didn't give me anything and I don't feel like looking any harder. When the drop pod enters play, it must choose an enemy model as its target. Roll scatter dice as usual. If the drop pod would be placed on top of a non-vehicle unit, the unit suffers 2d6 wounds and is treated as if it was tank shocked. Death or glory cannot be attempted against this type of tank shock. If the drop pod would be placed on top of an enemy vehicle, that vehicle suffers a S10/AP1 hit. If the vehicle is destroyed or explodes, remove the vehicle from the board and replace it with the drop pod. If the vehicle survives, place the drop pod in base to base contact with vehicle. Is this too over the top for a house rule? Balanced/unbalanced? What do you think? As character portraits: Cut out the art and tape it on the character sheet like I used to, or look up the card in Gatherer, save the image, crop the border, and add it to the sheet before you print. As decks of random encounters: Create, for example, some goblin encounters, some mercenary encounters, a couple ogre encounters, and a dragon encounter. Then put five goblin cards, three mercenary cards, two ogre cards, a dragon card, and a bunch of lands in the deck. Shuffle and flip a card any time you would roll for a random encounter. Go on with the adventure if you flip a land; otherwise, play out the encounter as drawn. As NPC inspiration: Most of the cards have some kind of humanoid character in the artwork that can be used for inspiration. Like the Paizo product in the link above, you don't need to know a whole lot about the character in the picture to make some assumptions and fill in the gaps. It's certainly a lot easier than trying to make characters distinguishable off the top of your head every time. Granted, not all NPCs need to be distinguishable, but this gives that little imaginative kick-start that might be needed when an NPC you expected to be overlooked suddenly takes on more meaning. As random treasure: Artifacts will work best for this, but other cards can as well. Put in a bunch of cards that can be tied to D&D magic items and draw cards whenever you would normally roll on tables in the books. As random plot hooks: This might not be all that useful to most groups, but I think it would be cool to have a deck of interesting events to draw from when there is a lull in the action. Just think of the kick start your game would get if the DM drew Stone Rain and then had to think of how that might happen in the game. All of a sudden, the PCs have to deal with giant rocks falling from the sky, and then (of course) they'll need to investigate why such a freak event happened. Was it the beginning of a prophecy in which they are involved? Or just the work of an evil wizard? What do you think? Any other ideas that you've tried or considered trying? 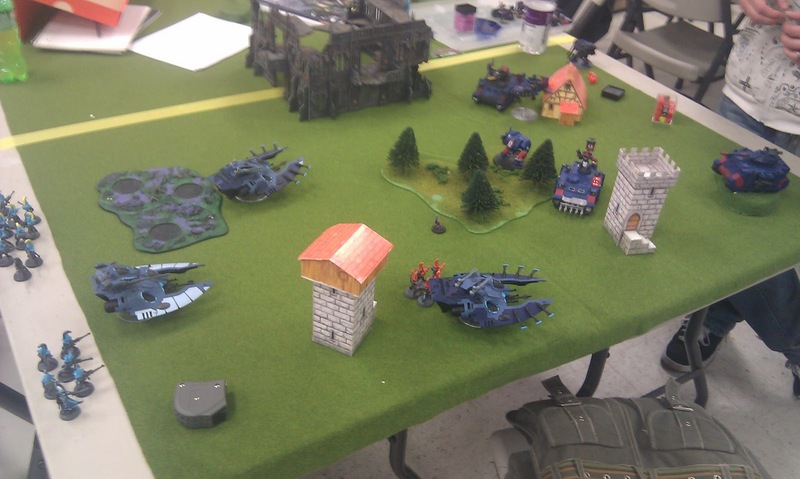 The tournament was a lot of fun, despite being only 750 points and having a low turnout. Only five people showed for this one, although I think a sixth person ended up entering late. Unfortunately, I'm writing this battle report several weeks after the tournament, so I'm going through my sparse notes and hoping my memory serves me well for the rest. Because of the time gap, this is a little less detailed than I'd like... but life gets in the way sometimes. It's the first time that I haven't posted a losing record. It's the first time somebody made the connection between me and my blog. This game was a lot of fun, although a little frustrating. We spent the majority of the game either missing one another or rolling shaken/stunned results. In this game, spirit stones would have helped me significantly, but the nerf ammo (as Jamil put it) still would have kept me from shooting. 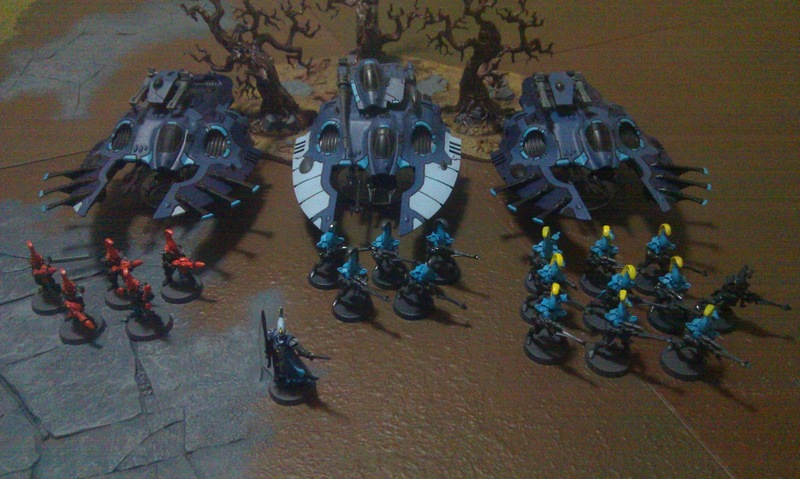 Objectives are set, and my opponent is about to deploy. 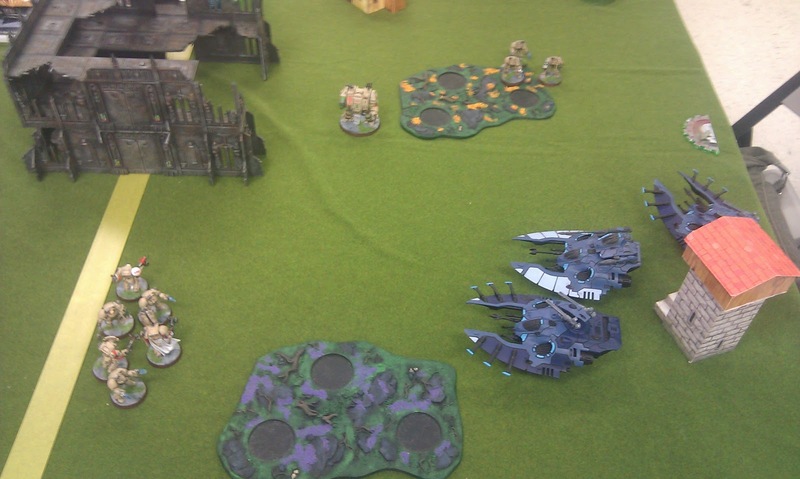 I dumped my fire dragons to kill the dreadnought, then lost their wave serpent and left them out in the open. It didn't take long for them to get shot to pieces. I thought the game was going to end in a draw. Objectives were contested, and neither of us controlled one. 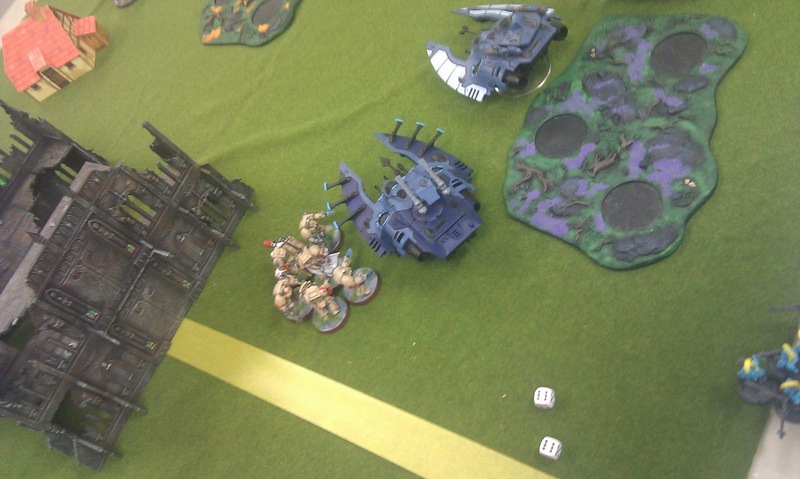 However, in his last turn, Jamil moved one of his tactical squads (in the razorback) from one objective (which I was contesting) to another (where I had no units). In the end, he won, one objective to none. Overall, I had a lot of fun in this match even though I lost. I made quite a few mistakes. The first (and perhaps the biggest) mistake was focusing far too much attention on the dreadnought. The speeder was much more threatening and would have gone down easier, but I ignored it for far too long. I also should have realized that his razorback could reach the other objective on that last turn, but after he shot my army to pieces, I don't think I had the units to contest all three anyway. This game was fun for me, but probably not my opponent. 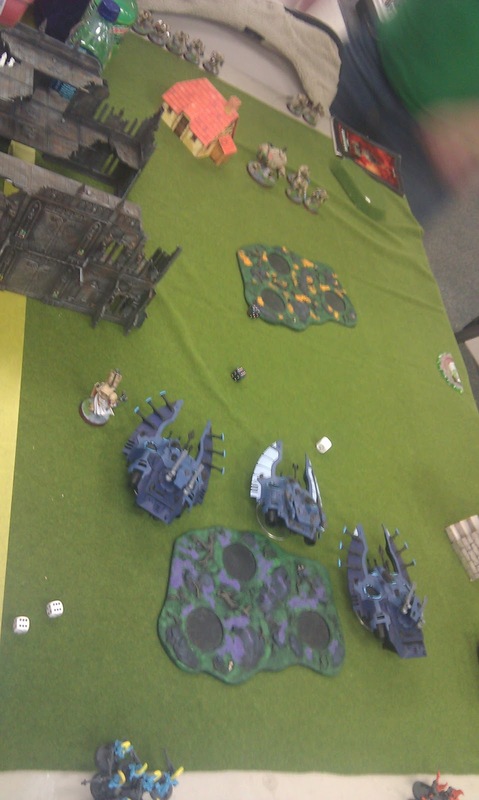 With a foot slogging force of assault focused terminators, it wasn't too tough for me to hop around the board and use my low AP shots to kill off his terminators one by one. I got greedy, though, and (like an idiot) tank shocked a unit, which set me back two kill points as he promptly called for a death or glory, wrecked a wave serpent, and then slaughtered the dire avengers inside. Had it not been for this mistake, I would probably have won decisively... instead, we had to resort to victory points for tiebreakers. Although the kill points were even (2-2), I had killed quite a few of those terminators, while he had only destroyed around 200 points worth of avengers and transport. Deep striking unit enters, but can't assault. I moved flat out the next turn to get out of assault range. Running away to shoot another day! 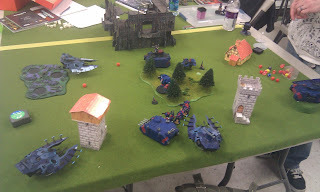 Note that the most irritating thing about this table was that those forest bases were actually treated like forests, except that the trees weren't there. I was constantly forgetting that there was even terrain there! "Cover save?!?! From wha... oh yeah... the invisible trees... nevermind..." Honestly, I'm still not 100% sure why the trees weren't kept with the forest bases. 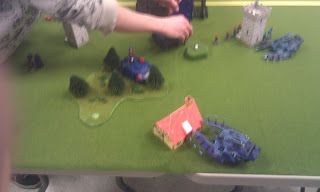 If you look through my pics carefully, you can see one of the detached trees as a random terrain piece on another board. The punishment for my greed... a downed serpent and a squad of doomed avengers. 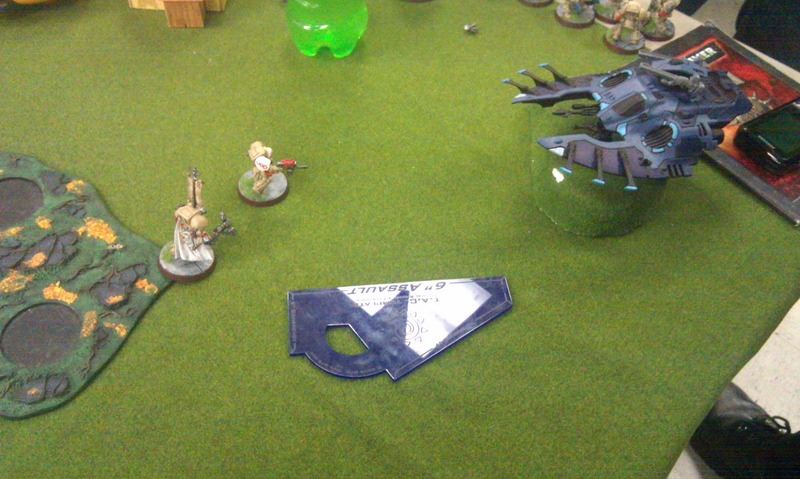 They did manage to do some damage in the shooting phase before terminators gobbled them up on my opponent's turn. End Game... just a hair shy of an assault that might have won him another kill point. I actually felt a little guilty after this game. Even though it turned out to be close and I won by tiebreaker, I had what could be considered the perfect foil for his army: very mobile transports and lots of AP1/AP2 shots. Jesse was a great sport, but I did not envy his position... moving and running each turn in hopes that I'd make a mistake on which he could capitalize. I have a great deal of respect for Jesse for doing just that: doing the best he could and capitalizing on my mistake. Many players finding themselves at such a disadvantage would have mentally checked out of the game (or quit altogether). I was really worried coming into this game, as I've never played against Tyranids before and I really didn't have any clue what each unit was capable of. It turned out not to be a huge issue, as runes of warding and lots of mobility kept most of his threats from touching me. I couldn't believe how his dice were rolling... If I didn't know better, I'd say he was rolling psychic tests with dice he made to cheat on D&D ability scores. 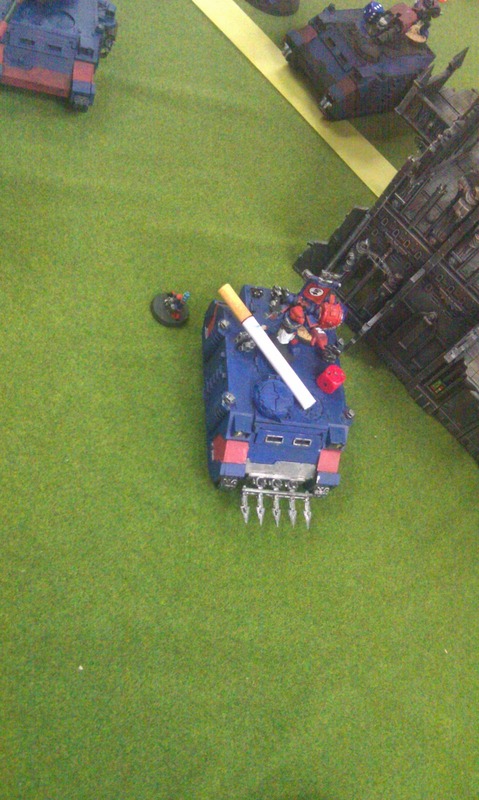 Almost every single turn, he was rolling something higher than 12 and suffering perils of the warp. Sometime during turn two (if I remember correctly)... I hadn't moved a whole lot, the swarm was advancing, and I was shooting as much as I could into it each turn before the inevitable flat-out "RUN AWAY!" moves. I took a risk here and dumped a squad of avengers, thinking that they would shoot that oncoming squad to pieces. They failed miserably. 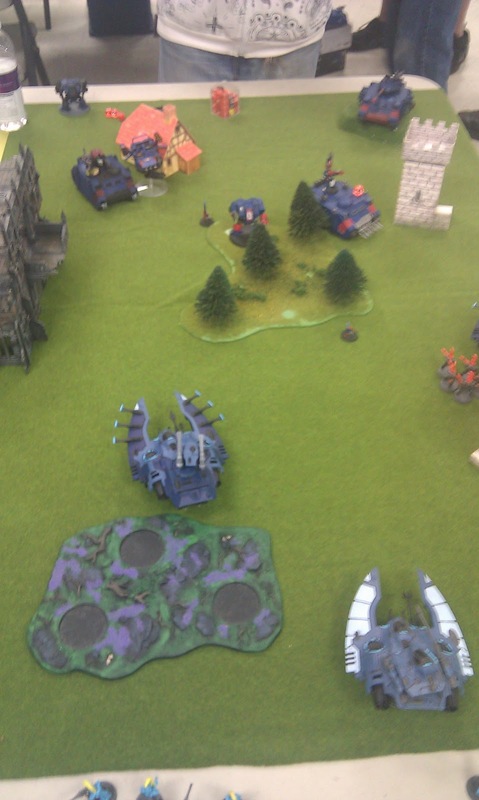 However, I did get some lucky rolls in the assault, and the two groups were still locked in close combat by the end of the game. By the end of the game, it was clear that my opponent was frustrated. 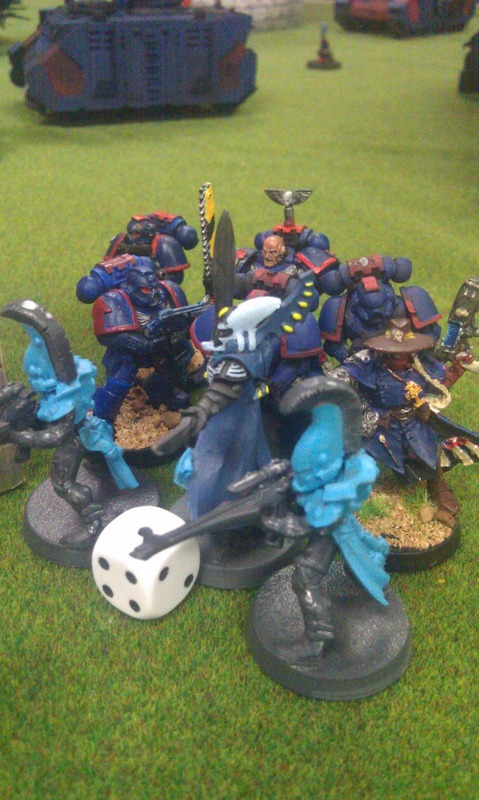 His dice had turned against him and his army was having trouble keeping up with fast skimmers. This one turned out a victory for the Eldar. In the end, I ended up in the top four and I had played each of the others already... so we rolled off and played random opponents. And who did I play? The only one who had beaten me already! UGH! I was determined that this game would be better than the last. By "better" I mean that: I'll either win, or defeat will come swiftly. To do this, I played much more aggressively than I did in the first game. I considered playing much less aggressively and just going for the late game objective grabs, but that idea ran completely opposite of my "swift defeat" plan B.
Ugh... THIS table again... at least one set of "trees" was replaced with a set of trees that actually blocked LOS. Played this game a lot less conservatively... dropping the dragons and taking long shots at that rhino was one example of my loose and more aggressive play. By the end of the game, I had almost nothing left and I hadn't killed enough to make myself feel better. I did almost kill one squad of marines, but the one marine I couldn't kill passed his leadership check and promptly jumped back into a transport to make it scoring again. In hindsight, I think I need more practice against well-rounded lists. Spending so much of my time playing against orks and tau, I tend to overemphasize either shooting or assault and perform well. Playing against Jamil's marines, I found myself constantly second guessing my tactics because I couldn't out-shoot him or out-assault him. 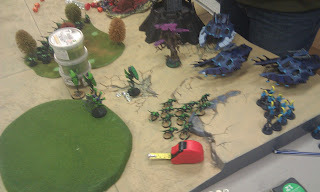 This is where the experience comes into play with Eldar... they can be amazing, but they don't leave much room for error, and playing against tactics that I haven't met before led me into some dumb tactical decisions. I had a ton of fun, and I'm looking forward to the next tournament. While I was there, I learned about several other places to play that are at least reasonably close. Hopefully I'll find the time to check them out and get more competitive play in. 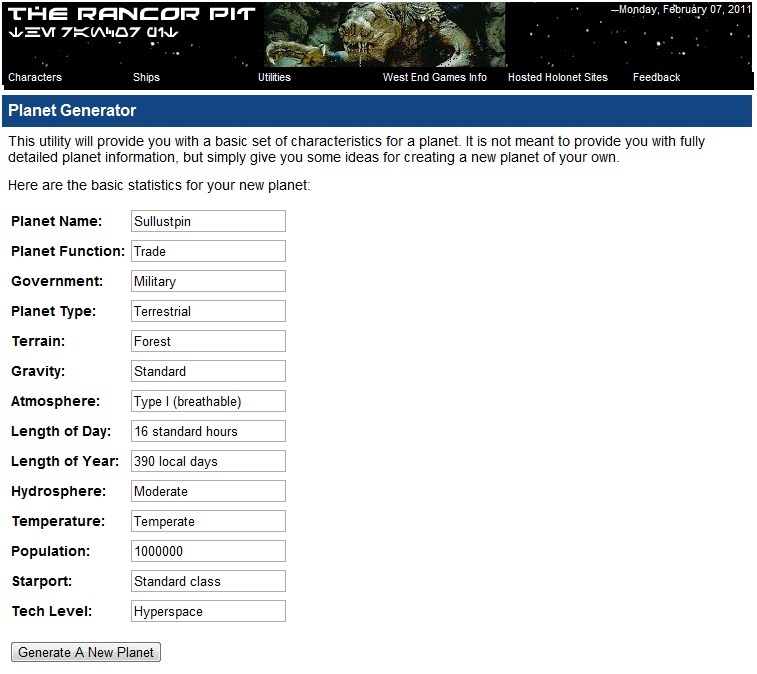 If you're looking for a simple but effective way of generating random planets, this cool little web based utility will give you some cool information. It generates the planet's name, function, government, type, terrain, gravity, atmosphere, length of day, length of year, hydrosphere, temperature, population, starport, and tech level. Originally intended for use with the D6 based Star Wars RPG, it would be useful for a Phase World campaign, d20 Future, or any other science fiction RPG that emphasizes space travel. It could even be used to help with writing Warhammer 40K fluff. 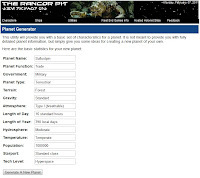 The Rancor Pit also has quite a few other resources for the Star Wars RPG, including character sheets, ship logs, a dice roller, a pretty active forum, and a ton of other stuff. If you're into Star Wars or just looking for resources for your science fiction campaign, you should give it a look. 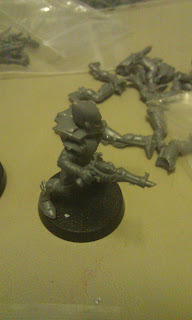 The fusion guns I'll still probably do the same way I did last time unless I come up with a better idea soon, but I like the look of the Guardian/Wych kitbash a whole lot better than the Guardian/Empire Troops kitbash that I did last time. At such small point totals, I'm running without my trusty seer council. And I'm also running without my guardian defenders. Both are pretty good at what they do, but are a little pricey. By adding them, I feel like I'm compromising too much at 750 points. We'll see by the end of the day whether I'll end up wishing I had them. 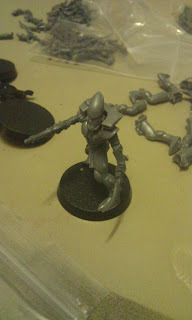 For the most part, my Farseer will be deployed with the smaller group of Dire Avengers in the Falcon. However, I'm thinking I might find some excuses to deploy him with other units. Against hordes, I might deploy him with the bigger group of avengers to make sure more shuriken catapult shots hit... and yes, I know I'd be better with a doom-seer for horde thinning, but it's just 750 points, ya know?! If I see a land raider across the table... or a monolith... or something else suitably difficult to kill, I might deploy him with the Fire Dragons. I don't know... there's some flexibility there that I just started considering last night. I still haven't heard a definitive answer on whether or not we'll be able to use reserves. 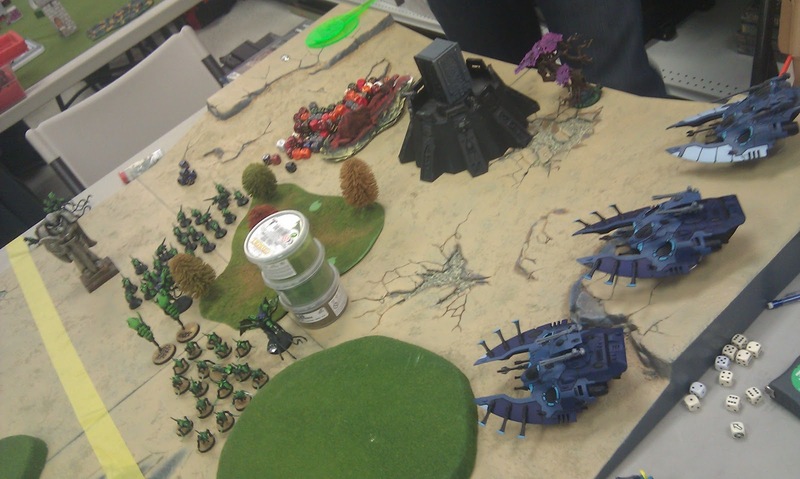 They weren't explicitly forbidden last tournament, but we were instructed to "deploy everything simultaneously," and I didn't want to rock the boat too much. I'm going to make a point of asking this time, though, as I got murdered by an Imperial Guard list last time and I would really like to deny a round or two of shooting to that kind of list. Like last time, I'll be taking notes and pictures, and posting my results here when all is said and done. Let's hope I'm not ashamed of the results I'll be posting sometime this coming week! Taking a warlock with both destructor and a singing spear is not optimal. Put your spears on warlocks that don't have destructor. Against AV 12+ it doesn't make a difference. 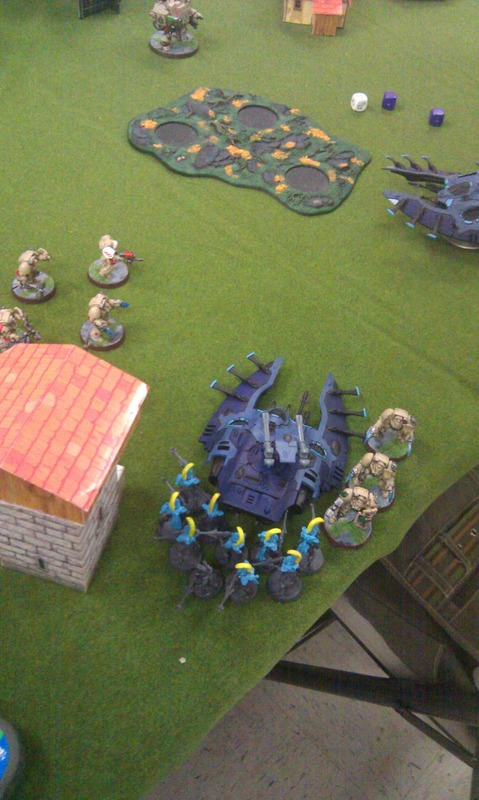 Destructor isn't going to hit, so the spears are the only attacks that matter. Against AV 10 or 11, destructor can do some damage. Having destructor and singing spear on the same warlock is just a waste of a chance to glance (or even penetrate vs. AV 10). 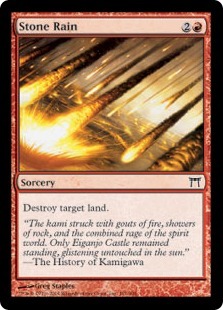 Those Str 9 spears are probably going to do the job without the need for the destructor hits, but why ignore potential damage when all it costs you is a little foresight when you're building your army? Note: This nitpick is pointless if all of your warlocks have both, but I don't need to point out why that isn't optimal.